Solid hardwood flooring is designed for the installation in any room below, at the level or above the ground level. Base non-conformity, mm Not more than 2mm х 2m.p. It is recommended to bring the unsealed boxes with flooring into the room and keep them inside for a certain time. The hardwood flooring has to have the room temperature. Film is necessary to protect the flooring from the eventual moisture ingress. Film to be laid out in the entire base area with overlap and along the walls base. Joints are fixed with a duct tape. 9-mm plywood sheets are laid in two layers: the first layer is installed directly to the base with the margin of 10-15 mm from the wall without fixing, at the distance of 10 mm from one sheet to another (plywood sheets should not have joints); the second layer is laid at an angle of 45° so as the sheets of the second layer overlap the joints between the sheets of the first layer. Plywood sheets are fixed to each other. It is strongly advisable to start the flooring installation from a distant room, laying the boards away. Thus, you can avoid the further damage of the already installed flooring. Define the laying angle. It is recommended to lay the flooring at an angle 90° along the longest wall or diagonally. To prevent the flooring boards deformation along the perimeter of the room, it is necessary to leave the expansion gap of not less than 10 mm between the flooring and walls, thresholds, doorways and stairs. Make sure that the expansion gap will be closed later by moldings. Using the chalk line, mark the base line parallel to the support wall. The distance from the base to the wall has to be equal to the expansion gap width. 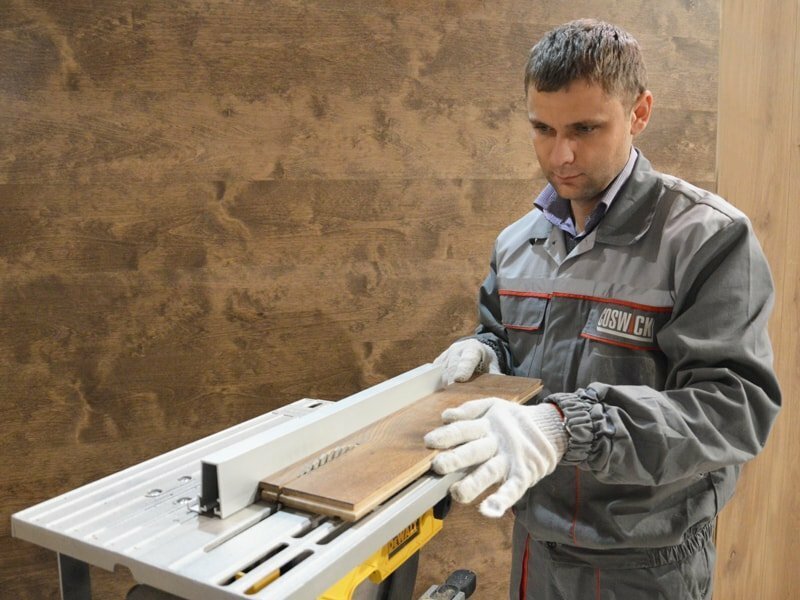 Before laying the flooring boards, it is necessary to match boards in colors and texture to find the best stylistic decision. Boards color and texture matching helps to install the uniform and well-balanced floor. Before applying, the adhesive has to have the room temperature. Before applying, mix the adhesive thoroughly until homogeneous. To apply the adhesive evenly, a trowel has to be put at an angle 45° in relation to the floor. 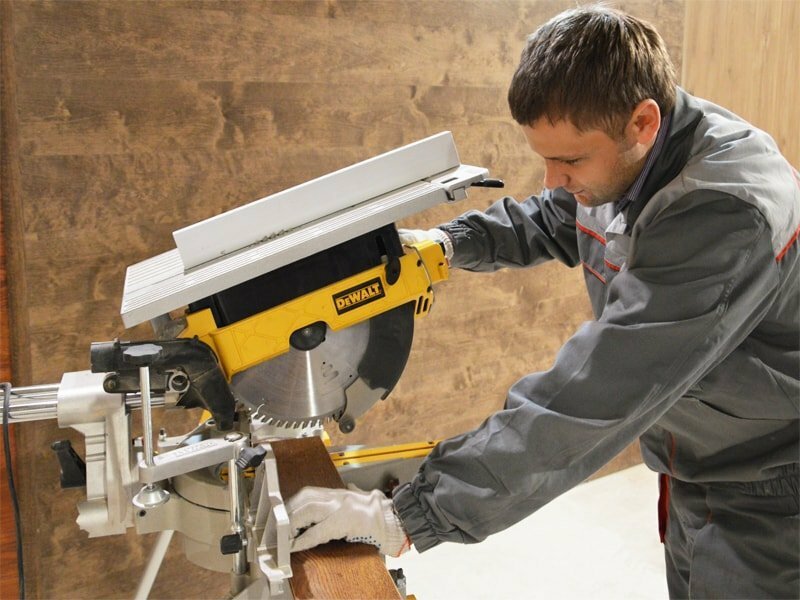 Using the special notched trowel, apply the adhesive to the base, covering the total width of 2-3 planks. Install the first row on the base line from left right. Doing so, the board tongue has to lay in the direction of the center of the room, and the groove has to face the wall. Lay the first layer and put the wedges to create the required expansion gap and fix firmly the first row planks. 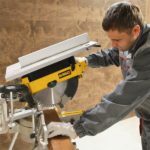 Flooring boards are fixed with a stapler gun with staples of not less than 40 mm in length. The fixation points are to be 20-25 cm from each other. With the margin of 5-6 cm from the plank end, the staple has to be stapled into the tongue at an angle of 45 degrees. Each plank has to be fixed in at least two places. Trim the planks so as lateral joints lay randomly with the shift of not less than 400 mm relative to each other. 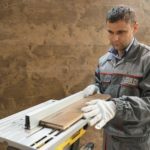 To prevent the “aligned joints” pattern make sure that the first plank in the next row is at least 150mm longer or shorter than the first plank of the precedent row. To minimize the planks outgo, choose the longest plank to be installed at the row end. Thus, cutting the longest plank, the remains can be installed as the first plank in the next row. 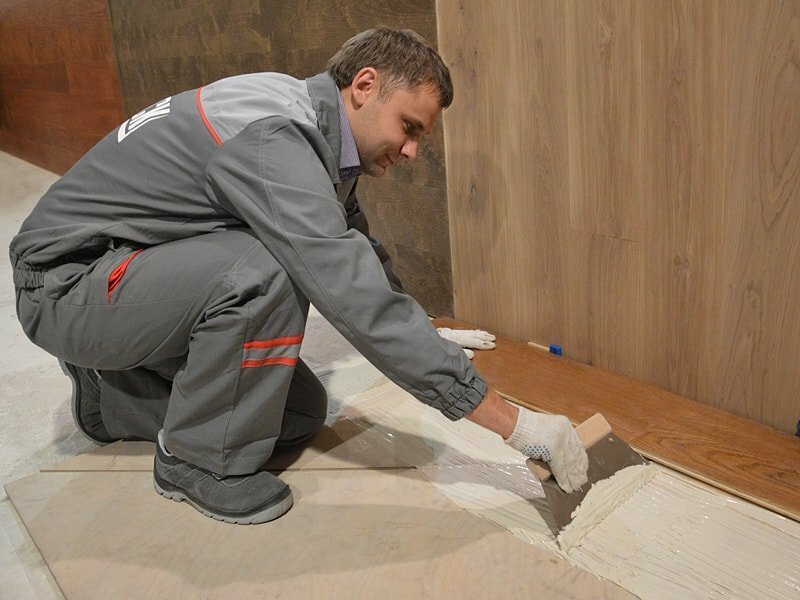 It is necessary to mark and drill the apertures in the hardwood flooring in places where the tubes for the central heating system will be mounted. The size of such an aperture has to be 10 mm bigger that the actual tube diameter. The last row plank to be measured using the tape measure and trimmed in size so as to provide the expansion space of 8-10 mm from the wall or ledge. When installing the last row, measure the width using the tape measure and cut the last board lengthwise in such a way that the expansion gap is 10-15mm. When the installation is finished, remove the dust and debris with a vacuum cleaner and clean the floor with Coswick cleaner. Leave the room for 24 hours before removing wedges and installing baseboards and moldings. Install the baseboard along the perimeter of the room. Fix the baseboard to the wall only. Do not fix the baseboard to the flooring boards. Before putting the furniture back, cover its legs with protective pads. Leave some planks in stock in case you need to repair the damaged ones.